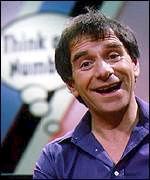 BBC Children's Programmes found perhaps their finest factual presenter in the unlikely shape of Bristol stand-up comic and former Butlins redcoat Johnny Ball . Ball became a well-known face via Play School (BBC, 1964-88) but also wrote gags for shows like Crackerjack (BBC, 1955-84). His often eccentric, clowning presenting style belied the keen intelligence that also scripted fifteen award-winning Think series from 1977 to 1987. Think of a Number (BBC, 1977-84) came first, and was a series of excitable science lectures, with Ball using visual props and young audience volunteers to help make his points. As the series progressed, the focus moved on from purely mathematics topics, despite the 'Number' title. Think of a Number ran concurrently with several spin-offs. Think Again (BBC, 1981-85) was a long-running variant on non-science subjects. Made in a small office set without a studio audience, this allowed Ball to be slightly more serious, providing sometimes philosophical explorations of topics as wide-ranging as money and age. Two series shown daily for just one week each were Think! Backwards (BBC, 1981) about numbers and introduced by Ball saying "Goodbye" and Think! This Way (BBC, 1983), about the points of the compass. After Think of a Number and Think Again ended, Ball provided an exploration of occupations from dentists to moviemakers via studio presentation, filmed reports and the occasional celebrity guest with Think It... Do It (BBC, 1986-87). The late 1980s brought obvious editorial changes and Ball was next seen among a younger team of presenters on Knowhow (BBC, 1988-90). This factual series tried hard to entertain - Ball's own series had made it look effortless - and included sci-fi sitcom Hyperspace Hotel among its contents. Soon after, Ball moved to ITV for several series of Johnny Ball Reveals All (1989-94), much more in the one-man-band vein of his BBC work. By the mid-'90s, children's TV was becoming obsessed with fresh-faced young presenters and Johnny Ball seems to have been a casualty of this ageism. Ironically, among these attractive young newcomers was his daughter, Zoë Ball . Busy today with lecture tours, he complained in 2003 that television now lacked factual children's programmes and "had become much more trivial".